and Barna Group, a leading research organization at the intersection of faith and culture, have partnered to present The State of Pastors, a groundbreaking study, research report, and live event and webcast giving insight into the needs, challenges, and well-being of today’s pastors. Drawing from interviews with more than 10,000 pastors from 40 denominations across all 50 states, The State of Pastors aims to give dimension to aspects of pastoral life that have, until now, been largely unexplored. How can faith leaders thrive in the midst of complex circumstances? How do they navigate a culture of increasing skepticism toward faith and where the dominant moral code is no longer tied to faith? How do pastors balance their own well-being with ministerial effectiveness? How are pastors faring in their marriages and friendships? In their relationships with their governing boards? Do they feel equipped to handle all aspects of their jobs? Do their strengths align with the expectations of their congregations? How do pastors handle challenges-including personal crisis, addiction, and the ubiquity of technology in their personal lives, their churches, and communities? "Pastors play a vital role in the health and well-being of society,” says Barna president David Kinnaman. "In a rapidly changing culture, where attitudes are growing increasingly skeptical to Christianity, how are pastors faring as they try to lead and love well within a contested culture? We explore this and more in the study. Our goal is for pastors to feel affirmed, challenged and informed to continue the transformative work they do in their churches and communities." In a continued partnership between Pepperdine and Barna, the complete published study findings will be presented on January 26, 2017, in a 160-page monograph complete with full-color infographics. 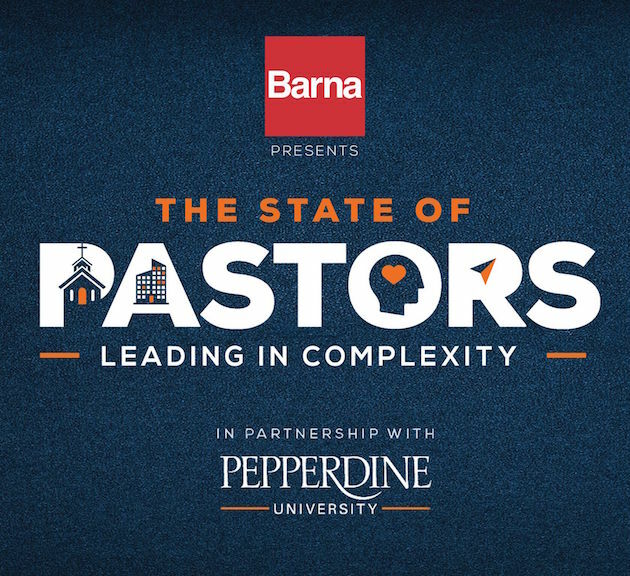 The findings will be discussed in depth at The State of Pastors: Leading in Complexity, a signature event and webcast, live from Pepperdine’s Malibu campus. The two-part event will include a series of live interviews and pre-produced video segments leading up to the release of the research data and a presentation of study highlights and insights. Attendees will hear from Barna president Kinnaman, experts, and special guest speakers as they explore the mental, physical, financial, emotional, and spiritual well-being of today’s pastors. Pepperdine University and Barna Group invite pastors, spouses, elders, deacons, and ministry leaders alike to listen in and come away with best practices for staying resilient in the face of a complex and changing culture. Rick Gibson, chief marketing officer and vice president for public affairs and church relations at Pepperdine explains, "This unprecedented study by Barna brings issues facing Christian faith leaders to the forefront during a pivotal time in which we are being called to look at many social questions through a Christian worldview. It is important that our community takes the time to examine how the complexity of our era is impacting our pastors and how we can best support them. As a Christian university, Pepperdine is excited to be partnering with Barna on this opportunity to bring congregations closer together." For more information, to view the full event schedule, or to register for the event and webcast, visit the Barna website.